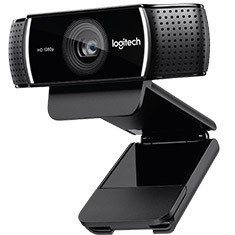 Stream and record vibrant, true-to-life HD 1080p video with the Logitech C922 Pro Stream Webcam that captures the most exciting details. Get fast, smooth uploads with H.264 – advanced compression technology that demands less network bandwidth. Stream clear video even in dim light, the video automatically adjusts to accommodate flickering room lights or multiple computer screens while two omnidirectional mics ensure clear, no-drop streaming and recorded audio.